Trains from Toulouse . . . 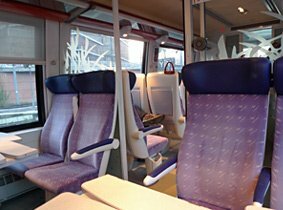 This page explains how to buy train tickets from Toulouse to other European cities at the cheapest prices, buying online direct from the operators, usually with print-at-home tickets. Click here to buy tickets starting in another city. Take a moment to read these important tips for buying European train tickets. It answers all the usual questions, "Do I need to book in advance or can I just buy at the station? ", "Can I stop off? ", "Are there Senior fares?" and that old favourite, "Should I buy an $800 railpass or just buy a €35 point-to-point ticket online?". And most important, click here to understand how far ahead you can buy train tickets. Option 1, fastest, high-speed TGV trains link Toulouse Matabiau station with Paris Gare Montparnasse in as little as 4h17 at intervals through the day. These TGVs take the conventional line to Bordeaux then the high-speed line to Paris. Option 2 is to use the original, slower but more direct line through Cahors, Brive, Limoges and Orleans. 200km/h (125 mph) Intercité trains link Toulouse Matabiau with Paris Gare d'Austerlitz in around 6h40. This route can be cheaper. Fares start at €20 and rise like air fares as departure approaches to over €115 full-flex bought on the day. So book ahead for the best prices. All TGV tickets and (on this route) Intercité tickets automatically include a reserved seat, so they can in theory sell out, though in practice usually have places even on the day. Check times & buy tickets at www.loco2.com or www.trainline.eu. You print your own ticket. Tip: To find the cheaper route via Limoges, use www.trainline.eu and find the via button. Enter Limoges as a via point. 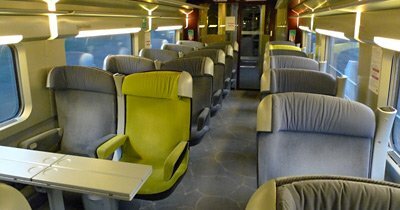 Toulouse to Paris TGVs will be single-deck TGVs of the TGV Atlantique design with the Christian Lacroix interior. 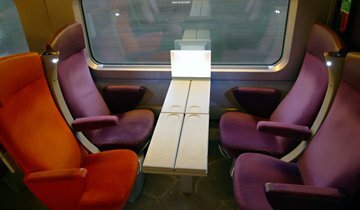 On TGV Atlantique, one first class car (car 1 or 11) has conventional open-plan seating, the other two first class cars (cars 2 & 3, or 12 & 13) have face-to-face tables for two on one side of the aisle, and open semi-compartments with bays of 4 seats around a table on the other side of the aisle. The 2nd class cars are all conventional open-plan. A TGV Atlantique at Paris Montparnasse. 1st class with a mix of unidirectional seats, solo seats, tables for 2 & tables for 4. Seats 2+1 across car width. Panorama photo. Simply check times and buy tickets at www.loco2.com or www.trainline.eu. Regular Intercités & TGVs link Toulouse with Bordeaux. Less regular Intercités link Toulouse with Carcassone, Narbonne, Montpellier, Nimes and Marseille. Change at Nimes for Avignon and Aix-en-Provence. Change at Marseille for Toulon, St Raphael, Cannes & Nice. Regular TER regional trains link Toulouse with Carcassonne, Narbonne, l'Hospitalet (for Andorra) and Latour de Carol. Regular TER regional trains & Intercités link Toulouse with Tarbes, Lourdes, Pau and Bayonne. Remember that TGV high-speed trains & (on these routes) Intercités are all-reserved so can in theory sell out (though in practice usually have places even on the day) and they have dynamic pricing, cheaper in advance, more expensive on the day. TER regional trains have one fixed price and no reservations, you can buy on the day, tickets cannot sell out. See the Train Travel in France page for more information. 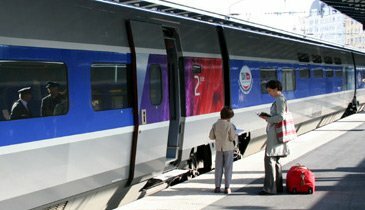 There are direct TGVs between Toulouse and Lyon, check times & buy tickets at www.loco2.com looking for a direct train with 0 changes. You print your own ticket. You'll find various departures using an Intercité train from Toulouse to Marseille in around 4h, then a TGV or TER from Marseille to Nice in around 2h35. It's a great ride across Southern France, past lakes with flamingos feeding in the shallows between Narbonne and Montpellier, past Béziers cathedral, and best of all, the superb views along the Mediterranean coast between Toulon and Nice. Check fares and buy tickets at www.loco2.com, looking for options with just 1 change. You print your own ticket. Marseille is a great city, if you can fit in an overnight stop there, do so. At least wander down to the Vieux Port between trains, even if you don't feel like hiking to the lovely Eglise Notre Dame de la Garde, or have time to take the ferry to France's 17th century Alcatraz, the Chateau d'If out in the bay, of Count of Monte Cristo fame. Step 1, take a TGV from Toulouse Matabiau to Paris Gare Montparnasse in around 4h20 from €20. Change trains and stations in Paris by metro or taxi. Allow at least 60 minutes between trains for this. Step 2, take a Thalys high-speed train from Paris Gare du Nord to Brussels Midi in 1h22 from €29. Change in Brussels for a Belgian domestic train to Bruges, they run twice an hour. No reservation is necessary or possible for these, you just sit anywhere you like. 10 Minutes is enough to change in Brussels, if the Thalys is late and you miss one, you catch the next one. Belgian domestic tickets are good for any train that day. 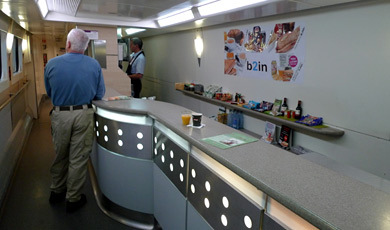 To buy tickets, book from Toulouse to Brussels or Bruges at www.loco2.com or www.trainline.eu. You print your own ticket. Tip: You can book this as one journey, but make sure it gives you an hour between trains in Paris, it sometimes gives less than this. It can be better to book from Toulouse to Paris first, add to basket, then book Paris to Brussels, add this to your basket and check out. The latter method gives you more control and allows you to build in stop off in Paris, perhaps to have lunch there - maybe at the Train Bleu Restaurant at the Gare de Lyon or at one of these restaurants at the Gare du Nord. A Thalys high-speed train. See full-screen panorama photos inside a Thalys train. More info on Thalys. Step 2, take a Thalys high-speed train from Paris Gare du Nord to Amsterdam Centraal in 1h22 from €29. To buy tickets, book from Toulouse to Brussels at www.loco2.com or www.trainline.eu. You print your own ticket. A Thalys at Amsterdam Centraal. See full-screen panorama photos inside a Thalys train. More info on Thalys. This is explained in detail for both directions on the London to France page. Check times & buy tickets at www.loco2.com. To Geneva, you'll find various options with 1 change, but look at the details carefully. Those via Paris mean changing stations by metro or taxi. 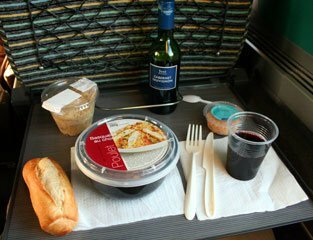 It's better to go for 1-change options using a TGV to Lyon and TER to Geneva (several departures per day, nice scenery between Lyon and Geneva), or Intercité train to Marseille and TGV to Geneva (one per day, also good for scenery). To Basel or Zurich, you'll often find it quicker to take high-speed trains into Paris and out again, though this means changing stations by metro or taxi. If you really want to avoid Paris, travel to Geneva, then take Swiss domestic trains to anywhere in Switzerland. Day 1, travel from Toulouse Matabiau to Marseille St Charles in around 3h55s from €20 by direct Intercité train. You can leave Toulouse Matabiau in the early evening arriving late evening in Marseille, but personally I'd leave earlier for a pleasant afternoon or evening in Marseille. Check times and buy a ticket at www.loco2.com looking for a direct train with 0 changes. You print your own ticket. Note that on Mondays-Fridays at least, it's theoretically possible to leave Toulouse early morning and make a same-day connection with the Marseille-Milan Thello train referred to in step 2 below, but any delay and you're toast, so I'd stick with the overnight stop. Stay overnight in Marseille. Inexpensive hotels with good reviews just outside Marseille St Charles station: Ibis Marseille Centre Gare St Charles, Holiday Inn Express Marseille St Charles. Marseille is a wonderful city, well worth a look around. At least wander down to the Vieux Port, even if you don't feel like hiking to the lovely Eglise Notre Dame de la Garde, or have time to take the ferry to France's 17th century Alcatraz, the Chateau d'If out in the bay, of Count of Monte Cristo fame. Day 2, there's a TER train leaving Marseille St Charles at 09:58 arriving Nice Ville at 12:39. Fixed price €35 which you can buy on the day or buy at www.loco2.com, valid on any train to Nice with no seat reservation necessary or possible. This is a lovely journey all along the Côte d'Azur, past rocky headlands, bays, yacht-filled harbours and millionaires' villas. Enjoy! Day 2 afternoon, travel from Nice to Genoa & Milan by direct Thello train, leaving Nice Ville at 14:02 every day arriving Milan Centrale at 18:50. 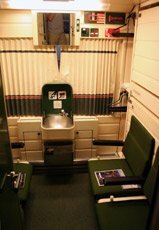 This comfortable Thello train has a cafe counter and power sockets at all seats, fares start from just €15 if you book ahead. There's lovely scenery along the Italian Riviera, too. There's more lovely scenery along the Italian Riviera. Change at Genoa for La Spezia, Pisa & Rome, change in Milan for Florence, Verona, Venice. Book from Nice to anywhere in Italy using either www.loco2.com or www.italiarail.com. For Thello & other Italian trains it's ticketless, you just quote the booking reference on board. If you want to spend more time in Marseille or Nice, there's also a later Thello train from Nice to Milan, leaving Nice Ville at 18:08 and arriving Milan Centrale at 22:50, this train in fact starts back in Marseille at 15:28 on certain dates, but obviously without any same-day onward connections to Florence, Rome, Venice and so on. Bonjour Marseille! The Eglise Notre Dame de la Garde, overlooking the Vieux Port. The Man in Seat 61 says, "Toulouse to San Sebastian is easy enough by train. But people mistakenly put 'Toulouse to San Sebastian' into booking websites and wonder why nothing appears! You have to book from Toulouse to Hendaye on the Spanish border, then pay for the little Euskotren to San Sebastian separately, that's the trick. Easy when you know how!" Step 1, travel from Toulouse Matabiau to Hendaye on the Spanish border. 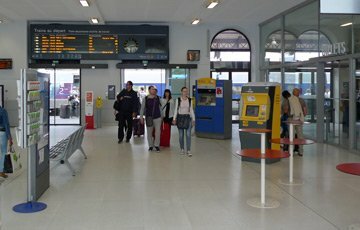 There are regular departures with 1 easy change in either Bayonne or Bordeaux, a leisurely journey of between 4h45 and 5h45 depending on train type and how the connection works in Bordeaux, with fares from €26 upwards. Check times & buy tickets at www.loco2.com. You print your own ticket. On arrival at Hendaye, walk out of the station and turn right, walk to the little Euskotren station in the corner of the forecourt. It only has one platform. Buy a ticket for around €2.55 and hop on the next metro train, they run every 30 minutes from Hendaye to San Sebastian-Donostia Amara station, journey time 37 minutes. See the photos below for more tips. You can check train times & fares from San Sebastian to Bilbao at www.euskotren.eus. Remember that San Sebastian is Donostia in the Basque language and the Euskotren station in San Sebastian is usually just called Amara. 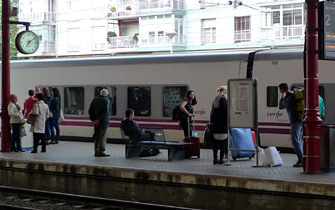 Local trains run every hour from San Sebastian Amara station to Bilbao's Zazpi Kaleak station (journey time 2h29 from Amara) or Bilbao's Matiko station (the train's final stop, 2h35 from Amara), fare €6.30, buy a ticket at the station. The trains used on this route are similar to the Hendaye-San Sebastian trains pictured above, along a route with some good countryside and coastal views. In Bilbao, Matiko station is 18 minutes walk from the Guggenheim Museum, Zazpi Kaleak station is further from the Guggenheim (22 minutes walk) but closer to both the old quarter and the 19th century new town. You can check train times & fares from San Sebastian to Bilbao at www.euskotren.eus, remembering that San Sebastian to Bilbao will be listed as Amara to Matiko as those are the station names. The adult one-way fare is shown as 'ida'. ...out of the SNCF station main exit & turn right. ...Buy a ticket from the staffed counter or the machines. There is only one platform, and it's where the trains start. So no worries, you can't get on the wrong train, they all go to Irun and San Sebastian-Donostia Amara. 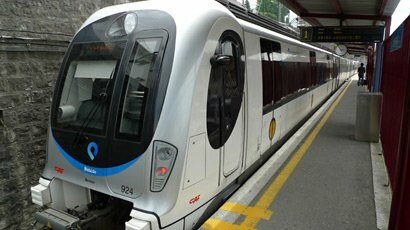 These air-conditioned metro trains leave every 30 minutes, a turn-up-and-go metro service called Metro Donostialdea. There's plenty of space for luggage and they even have a wheelchair-accessible toilet. If you run a Toulouse to Madrid enquiry at www.loco2.com or www.trainline.eu, this is the way it will send you. Just look through the departures and prices you get online. You'll usually see a couple of daily departures with just one change, plus a couple of departures with 2 changes. Total journey time around 6h49-7h40 depending how the connections work. You get great views of Mt Canigou at the southern end of the Pyrenees on this route. There's usually a morning departure around 08:00 (not in winter) using the direct AVE S100 from Toulouse to Barcelona Sants from around €29, then an AVE S103 from Barcelona Sants to Madrid Atocha from around €35. You'll also usually find a slightly later morning one all year round with 1 change at Narbonne, and some afternoon departures with changes at both Narbonne and Barcelona Sants. The Man in Seat 61 says, "Toulouse to Madrid via San Sebastian is easy and comfortable by rail and often the cheapest way, but booking systems won't show it when you ask for Toulouse to Madrid. That's because French trains are not currently extending one stop across the border to Irun for technical reasons, they are all terminating at Hendaye on the French side. But the Spanish trains all start at Irun, which leaves a 2.7km (1.7 mile) gap between trains, easily bridged by local Euskotren metro or by taxi or 36 minutes on foot, but booking systems aren't intelligent enough to tell you that!" There are regular departures with 1 easy change in either Bayonne or Bordeaux, a leisurely journey of between 4h45 and 5h45 depending on train type and how the connection works, with fares from €26 upwards. For a same-day journey from Toulouse to Madrid, you need to leave Toulouse before 07:00, only possible on Mondays-Saturdays. Why not stop overnight in San Sebastian? Another option is to catch any train you like from Toulouse to Hendaye on day 1, spend a pleasant afternoon or evening in San Sebastian and stay there overnight, then take the morning train to Madrid on day 2. 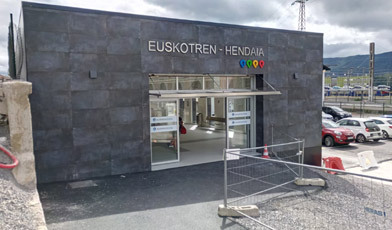 On arrival at Hendaye, walk out of the station and turn right, walk to the little Euskotren station in the corner of the forecourt. It only has one platform. Buy a ticket for around €2.55 and hop on the next metro train, they run every 30 minutes from Hendaye to Irun & San Sebastian Amara, journey time to San Sebastian Amara is 37 minutes. Whether you change to the mainline Spanish train in Irun or at San Sebastian Amara is entirely up to you, it's about a 10-minute walk between the Euskotren station and the mainline Renfe (Spanish Railways) station in both Irun and San Sebastian, but clearly San Sebastian is a nicer place to wait if you have a lot of time between trains. 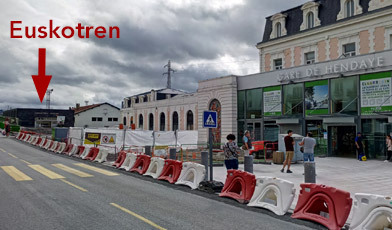 See the photos above for photos, travel tips & more details on the Euskotren connection between Hendaye, Irun and San Sebastian. There are two fast Alvia trains per day, morning & afternoon, and you'll also find one or two slower Media Distancia trains. I'd stick with the Alvias as they are faster (in fact, the Alvias are lovely trains to travel on, see the photos below). 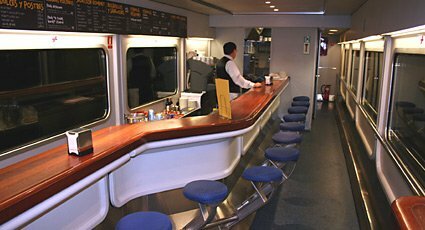 The Alvia trains have turista (2nd class) & preferente (1st class) and a cafe-bar, with fares from €25. All seats are reserved, prices vary like air fares so book early for the cheapest fares. 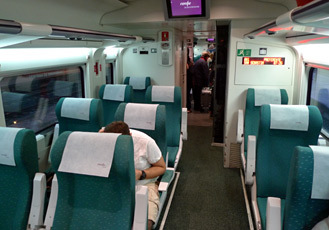 If you want to travel from Toulouse to Madrid in a day, you'd take an early morning train from Toulouse to Hendaye (not possible on Sundays)and the afternoon Alvia from Irun or San Sebastian to Madrid, leaving Irun around 14:50 and San Sebastian around 16:30, arriving Madrid Chamartin around 22:10. If you're stopping in San Sebastian overnight, the morning Alvia leaves San Sebastian around 08:50, arriving Madrid Chamartin around 14:30. Check times & buy tickets for this train at www.loco2.com. You print your own ticket. The first stage of the journey to Madrid is a lovely descent out of the mountains, just sit back and enjoy with a cup of cafe con leche from the cafe-bar car. The Alvias travel at relatively low speed on Spanish 5'6" gauge tracks as far as Burgos, then they pass slowly through a shed where their axles are changed to 4' 8½ standard gauge. 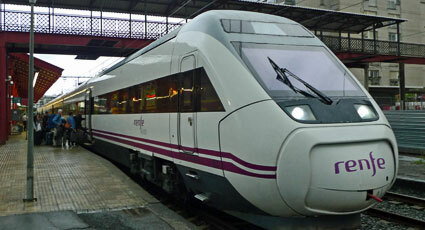 They then dash over the standard-gauge high-speed line to Madrid at up to 155mph. Tip: There's a lovely rustic bar at San Sebastian Renfe station, just at the end of the nearest platform at the left-hand end of the station building (as you face it from outside). A great place for a morning coffee and croissant or afternoon beer while you wait. This is the way journey planners will always send you if you just put Toulouse to Barcelona into www.loco2.com. There's a direct AVE S100 from Toulouse to Barcelona Sants every morning except in winter, leaving Toulouse Matabiau around 08:00 arriving Barcelona Sants around 11:20, although times may vary. There are other options through the day with 1 easy change at Narbonne onto a TGV Duplex or AVE S100 to Barcelona Sants. The journey takes just 3h15 on the direct AVE S100 at up to 320 km/h (200 mph), a little longer on journeys with a change of train at Narbonne. You get great views of Mt Canigou at the southern end of the Pyrenees. Fares start at €29. Fares work like air fares so book ahead for the cheapest prices, if you need to go at short notice fares can be expensive, in which case you'll probably find option 2 is cheaper. Check times and buy tickets at www.loco2.com. You print your own tickets. Mt Canigou & the Pyrenees, seen from the train... One of the highest peaks in the mighty Pyrenees, the 2,784m (9,137 feet) high Mt Canigou dominates the skyline on the right all the way from Perpignan to Girona, see en.wikipedia.org/wiki/Canigou. This is a very useful route that journey planners won't show you! It's usually cheaper than taking a TGV as in option 1, especially if you can't book months in advance and it's more scenic, too. Step 1, take a TER regional train from Toulouse to Latour de Carol in around 3 hours, fixed-price around €28. There are various departures very day, you can check times and buy tickets for this journey at www.loco2.com. You print your own ticket. 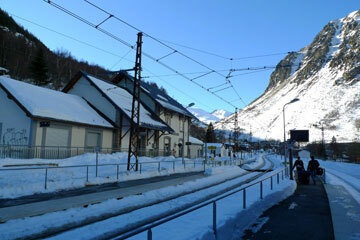 The train speeds across the plain from Toulouse, then climbs high into the Pyrenees, a lovely journey. Look out for the castle at Foix on the right just after the station. Step 2, in the afternoon, take a Spanish local train from Latour de Carol to Barcelona. 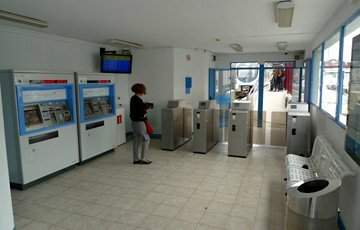 These run every couple of hours, journey time around 3h10, fare €12 or so, pay the conductor on board the train, tickets cannot be booked online or even bought at Latour de Carol station. You won't find these trains on any main journey planner as they are classed as Barcelona suburban trains (even though this is a rural route). You can check times at rodalies.gencat.cat/en/inici/ searching from La Tor de Querol-Enveig (the Catalan name for Latour de Carol) to Barcelona Sants. Tip: Latour de Carol has a vast station building, but is in the middle of nowhere surrounded by mountains. Three different track gauges serve the station: Standard gauge from Toulouse, the Spanish broad gauge to Barcelona and the narrow gauge of the 'Petit Train Jaune' towards Perpignan. I'd allow at least 30 minutes between trains at Latour just in case of delay, but if there's a longer wait between trains at Latour de Carol - as there usually is, because the French and Spanish don't co-ordinate their timetables - simply have lunch, coffee or a beer at the station bistro, www.facebook.com/bistrotdutrainjaune. There's very little else there! Peaceful, though. 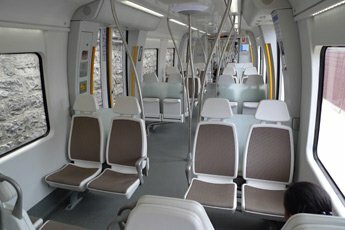 The smart interior of the regional train from Toulouse to l'Hospitalet. Latour de Carol, where two nations, two trains, three track gauges meet. On the right, a French standard-gauge overnight couchette train arrived from Paris & Toulouse. On the left is the Spanish broad-gauge local train which you take to Barcelona, the 'R' on the front stands for Rodalies, Catalan for suburban. The third gauge at Latour is the narrow-gauge Petit Train Jaune towards Perpignan, its platform is behind the couchette cars shown here. Step 1, travel from Toulouse to Madrid Chamartin or Barcelona Sants as shown above. 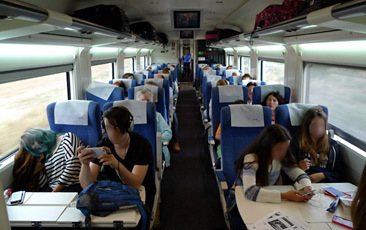 Step 2, travel from Barcelona or Madrid to Valencia, Alicante, Seville, Malaga, Cordoba, Cadiz, Algeciras, booked at www.loco2.com. In Madrid, you usually need to transfer by local train from Madrid Chamartin to Madrid Atocha as shown here so going via Barcelona might be better. Easy! Travel from Toulouse Matabiau to Hendaye the Spanish border, leaving around midday and arriivng at or before 17:35. Don't risk any tight connections, earlier is better. Then take the overnight Sud Express sleeper train from Hendaye to Lisbon, arriving next morning at Lisbon Oriente around 07:20 and Lisbon Santa Apolonia around 07:30. See the Paris to Lisbon section for full details, this explains the journey, fares, what the trains and sleeper accommodation are like. The 12:52 TGV Duplex Océane from Paris to Hendaye calls at Bordeaux St Jean around 15:02, you simply travel to Bordeaux then get on that TGV in Bordeaux, and obviously book Toulouse-Hendaye instead of Paris-Hendaye. 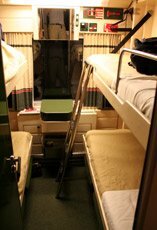 4-berth sleepers (Turista Cama) are cosy & inexpensive, they convert from beds to seats. 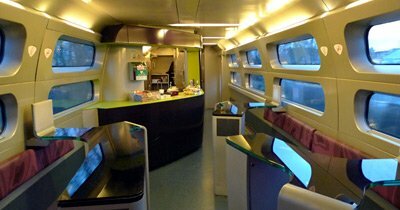 Step 1, take a TGV from Toulouse Matabiau to Paris Gare Montparnasse in around 4h20 from €20 upwards, book online at www.loco2.com. Fares work like air fares, so book early for the cheapest prices. You print your own ticket. Step 2, travel from Paris to Cologne, Frankfurt, Munich, Berlin or anywhere in Germany as shown in the Trains from Paris page. Paris to Cologne takes 3h20 from €35, Paris to Frankfurt takes 3h50 from €39. You can buy tickets at www.loco2.com, you print your own ticket. Step 1, take a TGV from Toulouse to Paris Gare Montparnasse in around 4h20 from €20. Book this at www.loco2.com. Change trains and stations in Paris by metro or taxi. Allow at least 60 minutes between trains for this, but for mission-critical connections I'd allow at least 2 hours. Step 2, travel from Paris to Scandinavia, Austria, Slovakia, Czech republic, Poland, Russia, Ukraine and all points east as shown on the International trains from Paris page.